This weekend was exhausting, but VERY rewarding. Saturday evening, around 8:05 I got a phone call. It only took 2 sentences and 10 minutes to find me on the road, driving out to the 909 (Yes, I’m a refugee from the I.E. Well, so’s Violet, and you all like HER well enough! shut up) for an indeterminate amount of time. 1. They’re at the hospital again. 19 inches; 7 lbs. 2oz. of concentrated bundled love named Levi Thomas. 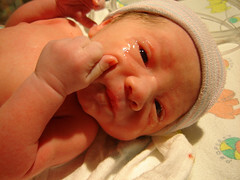 And I’m sure, once he grows out of his old-geezer-looking newbornness, he’s gonna be cute as hell! Tom is my only friend??? So, yes. The baby blanket’s done. I’m just waiting for the thumbs-up from my diligent test knitter, which will be any day now.